SOCK IT TO ME is committed to making a positive impact in the community, encouraging people to feel good and happy, and spreading these positive vibes to all those around them! Hence they are hosting the National Self-Confidence Day to inspire confidence and remind people to be proud of who they are! We’re using the hashtag #selfieconfidence and encouraging individuals to “post” a selfie of themselves on Instagram in celebration of the holiday, with a caption sharing what makes them feel proud and confident about themselves! 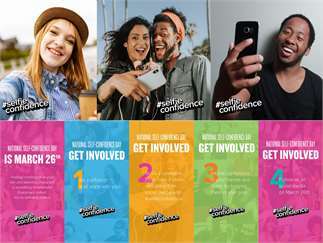 From 11 a.m. to 7 p.m. on Tuesday, March 26th (the official National Self-Confidence Holiday), the SOCK IT TO ME team will be celebrating the holiday at the Yamhill corner of Pioneer Square in downtown Portland, handing out exclusive #selfieconfidence buttons, other special goodies, and spreading the incredibly positive message of self-confidence!